What Can We Do in Crantock? Take the ferry across the river. Play a round at Holywell Bay Golf Club or Newquay Golf Club. Spend the day at Crantock Beach. Walk a section of the South West Coast Path. Have a family day out at Newquay Zoo. Book surfing lessons at Fistral Beach. Enjoy a night out in Newquay. Visit the Elizabethan manor house and gardens in Trerice. Buy tickets for the Lappa Valley Steam Railway. Visit ancient fishing villages, such as Port Isaac and Boscastle. Discover the cathedral city of Truro. Where Can We Stay in Crantock? Pitch a tent at Treago Farm Caravan and Camping Site, or Trevella Caravan and Camping Site. Stay in a self-catering holiday cottage on the headland overlooking the bay or in the village centre. The village of Crantock lies on the North Cornwall coast, two miles west of Newquay, on the southern banks of the River Gammel. Crantock is home to a beautiful, sandy cove, where surfing, swimming and sunbathing are popular. The river meets the ocean at the northern edge of beach, and there is a ferry across the water to Pentire Head, by Fistral Beach, during the summer months. Half a mile inland from the beach, the tiny centre of Crantock is home to a village hall, a church and a grocery which sells all the essentials for a day by the sea. In the middle of the village, the National Trust-managed Round Garden is believed to be one of the sites of the seven Celtic chapels that once stood in the area. One of the parish’s many wells is located nearby, and opposite the green, there is a memorial hall, built to remember those who died in the wars. The Cosy Nook Tea Gardens and Restaurant serves delicious cream teas and light lunches, while the Cornishman and the Old Albion are both welcoming pubs serving good food and a selection of local ales (and were once notorious centres for smuggling). To the west of the beach, towards West Pentire, C-Bay is a stylish restaurant serving great seafood and other dishes – all prepared with the freshest local ingredients. Perched on the headland with spectacular views across the bay, the Bowgie Inn is a popular spot for an afternoon pint. A short walk westward, Poly Joke Beach is a narrow and completely undeveloped cove, where the water is generally much calmer than at neigbouring Crantock. Crantock is renowned for its traditional annual events, including a lively street fair known as Crantock Summer Fiesta, featuring a coconut shy, raffle, tombola and stalls. Crantock also holds the world record for bale pushing, thanks to its annual festival of pushing straw bales around the streets. The town of Newquay is two miles north of Crantock, with some of North Cornwall’s best surfing conditions. Fistral Beach is the most famous spot, and is home to several surf schools, where beginners can take lessons. 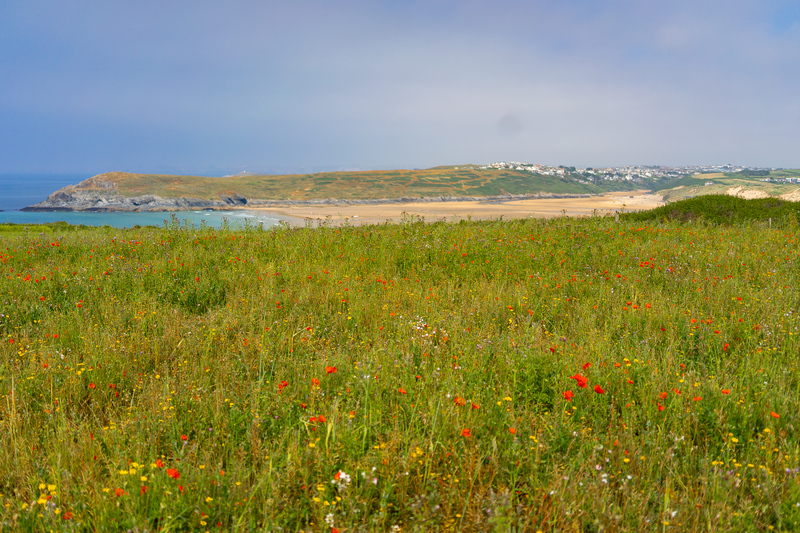 Fistral Beach is backed by dunes and an excellent golf club, and framed by a pair of rugged headlands. The town centre runs alongside Towan and Great Western Beaches, with plenty of surf shops, cafes and restaurants. Newquay is famous for its nightlife, and taxis can easily be booked from the town centre to Crantock for visitors planning a night out. The Southwest Coast Path is at its most spectacular to the west of Crantock, with breathtaking views across the Atlantic Ocean. Visitors who follow the path westward will cross a series of towering clifftops and walk through the grassy dunes of Perran Sands before arriving in the laidback surf town of Perranporth, which overlooks a long, sandy beach. The oldest part of Crantock was built around the church of St Carantoc, who founded the village. The church was founded in Norman times, as a cruciform, but was reconstructed during the 14th and 15th century by E.H Sedding, who is buried in the churchyard. The parish was once known as Langurroc, meaning Dwelling of the Monks. According to the Survey of 1294, it was a monastery of considerable wealth, with several churches and rich residents. Criminals are said to have been transported here from various parts of Britain to work in the mines, and are believed to have lived in caves and huts on the edge of the settlement. According to a local legend, criminals married the daughters of citizens, inviting the wrath of God, and a sandstorm blew for three days and nights, completely burying the village. The remains of an Iron Age settlement, known as Treringey Round, are located at Treninnick. It is said that a woman was horse-riding along the beach when she was cut off by the tide and swept out to sea, where she and the horse drowned. Her lover, a local man called Joseph Prater, carved her portrait and the poem into the rockface. How Do You Get to Crantock? Newquay Airport is eight miles from Crantock, with regular flights to cities across the UK, and a small number of destinations in the rest of Europe. Exeter, Bristol and London airports provide a greater range of routes. Newquay Railway Station is 3.5 miles from Crantock, with good connections to London and the rest of the UK. National Express coaches to towns and cities across the UK are available at Newquay Bus Station. From here, buses to towns across Cornwall are also available. Driving to Newquay from the east, exit the A39 or the A30 onto the A392 for Newquay, and continue onto the A3075 before taking a right turn for Crantock village. Crantock is a 4-hour 50-minute drive from central London and a two-hour 50-minute drive from central Bristol.